I’m thrilled to share a post from one of my oldest colleaguesDhariana Lozano. I’ve worked with Dhariana for over ten years and she has grown to be one of the most influential social media and digital marketers within the industry. She has setup her own agency Supremacy Marketing and often published posts on her blog as well as many industry channels. Each week Dhariana runs a segment known as #CoffeeWithDhari on her Instagram live stream. Within the livestream she promised her viewers a list of simple and effective things to try on social media within 2019. You can read the below repurposed post below or by visiting her blog as well. I think disappearing content or content that is only temporarily available will be big in 2019. It will give followers an extra reason to follow your brand on the particular social media network you’re publishing this kind of content on so they don’t miss out. We’ll discuss a few of these content forms in this post. Live videos will not slow down in social media in 2019 and tie into ephemeral content forms we just talked about. Live videos really let your followers see more of who your brand is behind the scenes. Their unscripted nature add a different element that can contrast a curated feed. They are a great way to “humanize” you brand and drive live engagement with your audience. Live videos can also be repurposed for content later on. Speaking of videos, I think vertical videos will become more popular on social media in 2019. We naturally hold our phones vertically and with the popularity of Instagram Stories and the introduction of IGTV I think there might be more of a shift to create vertical content. Keep going with those Instagram Stories! I don’t know about you but I’m spending a good amount of time scrolling through stories as opposed to going to the accounts of the people or brands that I follow. While we’re chatting about Instagram stories I think you should make use of the countdown sticker. I just had to bring this one up because I love! It’s a great way to remind people of what’s happening. I’ve been using them to remind my followers of my weekly #CoffeeWithDhari live story segment. A little bonus here: I think giving Facebook Stories a shot may be worth it. You can repurpose your Instagram Stories. The influencer marketing world is shifting. I think in 2019 more focus will be placed on micro-influencers. Micro influencers are people with smaller followings (think 10k). These influencers may have a more engaged audience than some of the bigger guys. Getting more personal will be a differentiating factor for brands on social media in 2019. In the crowded space of social media marketing, being laser focused will yield more results than trying to appeal to the masses. I predict brands will continue to get personal and get behind specific social and even political causes. Not to0 long ago brands wouldn’t touch issues like this – so it’s refreshing to see the turn around. Just like in life, your personality will attract the people you’re friends with. Showing more personality is also helpful in creating more engaging content on social media. I predict (and hope) that 2019 will bring the end of the concentration of vanity metrics on social media marketing. I mentioned this a little in my latest #CoffeeWithDhari session. In the new year I think there will be a stronger emphasis on engagement as opposed to paying attention to follower numbers. Likes may even be weighed more lightly. This is because with the decline in reach, making the most out of the audience you have, and reaching more of the audience you already have will have a bigger impact than just simply gathering likes. Have you interacted with a chat bot yet? The potential for brands using chatbots is immense. I ordered some items online and was able to get tracking info and updates right on Facebook Messenger. This should be a great aid to customer service. Definitely something to think about going into the new year. LinkedIn has been an all time favorite of mine. I think people and brands alike are starting to see the importance and potential of LinkedIn. The originators of the Groups feature – LinkedIn has been a place to gain super targeted and high value leads. LinkedIn has been revamping itself in the past few years and I think more people will be exploring the possibilities on this network in 2019. Last but not least, and somewhat unfortunately, I think social media ads will be big in 2019. With all the saturation going on, the only way to break through may be to pay to play. Social media marketing is an ever changing landscape. Just like you change over time, social media changes from day to day. 2018 has been filled with so many new features and innovations and I can’t wait to see where we will go in 2019. No matter what changes, just know that one thing will not – and that is the power of a strong social media strategy. I am looking forward to relaunching Building Your Brand On Social Media in early 2019! For now you can keep track of your own social strategy with my handy social media strategy checklist. To view the full article please visit Dhariana’s Blog and subscribe today to receive her notifications. Leave a comment and let me know if you have any recommendations of what you’re looking to try within 2019. Social media is constantly evolving as are the tools available for marketers to improve their brand and audiences within their social media channels and campaigns. Below I’ve outlined the Five Tools I’m using currently using or have my eye on to leverage within my 2017 plans. 1. Tweriod: One of the questions I get asked all the time is how to find out when your audience is online within Twitter, and what the best times to tweet are. Well, I stumbled upon Tweiod a few years back and have been spreading the word ever since! Tweiod gives you the ability to start tweeting when others are listening by providing you the best times to tweet. The tool analyzes your tweets and followers tweets and provides a detailed analysis of when your audience is active, and when you should start tweeting for maximum visibility and engagement. Paired with a scheduling tool this is a marketers dream to amplify engagement and build long term success! So how does it work? You sign in with Twitter allowing the tool read access to get a list of all of your followers and their tweets. The tool runs it’s analysis and when finished will Direct Message or Email you an update. It provides a breakdown showing the most exposure when you tweet over a specific day, weekends, or a combined view. They provide an upgrade to their premium plan depending on the number of followers you have ranging from $3.99-$15. I run an analysis every quarter or so and adjust my tweets accordingly. 2. Livestream provides the ability to broadcast live to a wider Facebook Audience. They announced recently the ability to install the app within your company Facebook page and then choose whether you want to broadcast from your smartphone or computer. CFA Institute has been working with Livestream since I joined to broadcast high quality sessions from our global events to a wider audience. We’ve got a channel full of broadcasts we’re always working to integrate these into our social media audience and raise visibility to a wider audience. Once you’re live you’ll be able to engage viewers though comments and your users will have the opportunity to engage with each other providing an interactive broadcasting tool. Following the end of your event your broadcast will continue to be available for people to find and engage with. We’ll be integrating this into our 2016 Events Strategy and I will report back on how this works within our mix. 3. Click to Tweet: If you’ve visited by blog before (or have paid any attention to this post) you’ve already noticed I’ve included click to tweet buttons within a good amount of my content. As a content producer my goal is to make it simple and easy for readers (like you!) to share my content across social media (and Twitter). Click to Tweet is hands down the easiest way to promote, share, and track your content within Twitter. You login and create the message you want tweeted including hashtags, handles, etc and it generates a basic link for you to paste into your content. You can simply hyperlink the words click to tweet or develop a visual image to easily drive engagement. We recently integrated this into one of our marketing campaigns within an email an saw almost 500 tweet from our click to tweet button in the email within the first 12 hours, a total success for our first try. The free plan allows your five links with auto shortening and tracking and upgrades range from $5 monthly for unlimited links to $500 a year for an enterprise plan to manage multiple accounts (ideal for a business). 4. Rafflercopter: One of the tools I have my eye on to integrate into my social media marketing mix this year is Rafflecopter. Social Media is all about engagement, and Rafflecopter provides an easy way for you to create a content to get people engaged with your account and build your following. I’m a sucker for entering any raffle where I have a chance to win something (really, anything!) and this tool keeps popping up within my feeds! I see endless opportunities for brands and marketers to incorporate this into tool into their strategy to mix things up and make it fun. Hey, after all everyone likes a chance to win something with 51% of US millennials would share information with companies in exchange for an incentive (USC Annenberg Center for the Digital Future). Click to Tweet. It’s easy to get started, signing up takes a matter of seconds and once you’re logged in you can setup a giveaway within a few minutes. You first choose your prize and decide how people can enter through numerous options (and yes, you can click more than one!). Next you’ll setup a time parameter and set your contest live! They’ve got a free trial you can easily get started with, and it’s inexpensive to continue with their upgraded plans. 5. Pablo by Buffer: The human brain processes images 60,000 times quicker than text and 90% of the information transmitted to the brain is visual. Social Media Platforms and Images go hand and hand for success with research by Twitter sharing that adding a photo URL into your tweet can boost retweets by an impressive 35%. Click to Tweet. Pablo by Buffer makes it easy to design engaging images for your social media channels within minutes. The Buffer Blog (one of my favorite sources of content) has a post here about how to get started and integrate into your mix. The tool provides ready to go templates, images, and quotes for you to use and it makes it fun to style you image adjusting your font or color, switching the photo from blurred to black and white, and adding a line of text or an icon in. It also allows you to upload an image of your own to overlay with text. We use this all the time during events to highlight speaker quotes in live time and drive engagement online. Once you’ve developed your image you can easily share to your social channels, download, or add into your buffer scheduling matrix. The only downside is they’re desktop only, hopefully a mobile version will come soon for those of us on the go, but to make life better, it’s completely free to use! What do you think of the tools I’ve suggested? I would love to hear if they’ve helped you at all, and please take a moment and share your favorite tool with me within the comments or send me a tweet! Social Media is changing faster than ever. It’s hard to believe that, only a decade ago, social media was little more than a budding trend. Of course there were websites such as Friendster and MySpace which had a decent level of adoption, but the population as a whole had not come around to it yet. These days a new social media channel or app seems to be popping up hourly, it’s exhausting to keep up! Did you know that the average american spends 40 minutes per day on Facebook? (Source: NBC News) When you consider how much time Americans spend engaging with digital media–nine hours a day—40 minutes on Facebook might not seem like a lot of time. (Click to Tweet). Social Media Examiner put together an easy-to-read Social Media Marketing Industry Report for 2015 which included insights which may help in determining and shaping your 2016 social media strategy. Below I’ve outlined five surprising social media stastics which may help shape or rethink your 2016 Social Media Strategy. By spending as little as six hours per week on social, more than 66% of those marketers are seeing lead generation benefits with social media. However to reach these goals marketers often rely on the help of social media management tools. 87% of marketers reported they don’t know which social media management tools are best to use. (Source: Social Media Examiner) *Need Help with Social Media Tools? Here are three of my favorite social media tools. Twitter moved up two spots from the 2014 report to be the number one social media platform that marketers plan to use more of in the future. YouTube and LinkedIn followed close behind, especially among B2B marketers. Surprisingly, Facebook saw an 8% decline in reported future use. (Source: Social Media Examiner). Quick Tip: Make sure you’ve got a plan to optimize and analyze specific social media channels to ensure you’re using your time properly. It’s important to know which channels to use based on the KPI’s and results you’re trying to drive. You MUST have a visual social media strategy in 2016, it’s crucial. The human brain processes images 60,000 times faster than text with 90% of the information transited to the brain is visual. If you want to shine on social media make sure you’re testing video, images, and quotes within your channels to best optimize and drive your KPIs. (Source: LifeLearn) *Need Help with Visual Social Media Tips, Check Out My Post “Don’t Get Left Behind, 6 Tips to Recharge Your Marketing Here. Let me know what you think, leave a comment or shoot me a tweet. Enjoy! 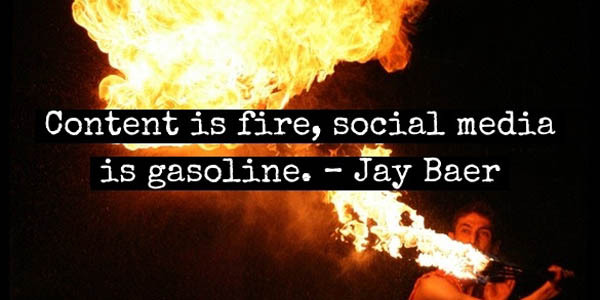 In 2013 Dave Kerpen shared a post on LinkedIn entitled Content Is Fire, Social Media is Gasoline. Within the post he discusses the importance of keeping it real while also keeping it relevant. If your social media informs more often than it promotes, you’re on the right track. If it is deeply helpful rather than deeply promotional, you’re probably on a roll. To get a better sense for how businesses can use content and social media together to be successful, Dave Kerpen asked Jay Baer to summarize the concepts of his book Youtility. Within the book he shares information regarding the concept of using marketing to promote your marketing. Brands often talk too often on social media and miss the mark by never saying anything other than “we’re great” and “buy buy buy.” With so many updates constantly on social media brands are competing for attention, and can do so easily by being useful, not by shouting louder. Dave uses the company ExactTarget as an example, sharing two tweets back to back. The first is a corporate message less relevant to a wider twitter audience. The second is a real time tweet which created content on the most popular Olympic sports based on followers, which was sent during the London Olympic games. The infographic has no information abut ExactTarget’s products and services, rather it used real time relevancy to create interest and to showcase some of it’s products (it has a software allowing companies to monitor and engage on twitter). Content is everywhere, you can’t help but consume it within your everyday life. Everyone has something they want to share with the world and we are constantly taking that information in. We put content out there through the tools of social networks, leveraging sites like Twitter, Facebook, LinkedIn and so on. Social media is what sparks our message and keeps the fire burning faster and brighter. Our number one tool so get our content and our message out there is the social media, and once we start the process, we need to keep feeding our fire. Within my role I’m consuming content about 90% of my day. I wake up each morning and check my Twitter account before even stepping out of bed. I download two newspapers each morning to read on my ipad during my 40 minute train each morning. I often sit next to my husband silently who does the same, and shares some additional content he finds on the various apps he checks into such as flipboard or good reader. At work I build social media strategies to help boost the content my company created, and I often get emails on my work and personal accounts with content my friends, family, and co-workers find interesting. It’s part of my job to keep up with these things, and also get myself out there. I send tweets more than I pickup a phone, and I am guilty of constantly checking and updating my social notworks, I admit it, i’m totally addicted. I learn new things everyday using social media and it keeps me up to date with what’s going on in the world and what is going on with my friends and family. After we delivered our son and shared the moment with close friends and family, hours later I posted a photo and watched it spread like wildfire, the texts, calls, and messages rolled in. I remember turning to my husband totally overwhelmed and overjoyed with the amount of messages I had to respond too, and it took me almost two weeks to circle back with everyone! I always remember Jay’s words, “Content is the fire, social media is the gasoline.” Keep feeding your fire and keep it going! Do what you love, and enjoy! Inspired by a slideshare posted by Natascha Thomson, The 10 Rules of B2B Social Media Marketing, I wanted to share my top five rules for B2B Social Media Marketing Success. Let me know if you agree, or what rules you follow by tweeting me @MarissaPick. #1: BREAK THE RULES AND HAVE FUN! Social media provides a way for marketers to test the waters and try something new. Social media is an exciting and new space to experiment, and see major returns. Break the rules, have a little fun, and as a brand let your corporate hair down. Social media gives a behind the scenes look into a person or brand, and can help to facilitate deeper engagement with your audience. Every social media campaign needs a strategy, and it’s crucial to understand your goals. Knowing what you want to accomplish and how you will measure success is crucial before you launch any campaign. All social media platforms are not the same, so leveraging the proper channels, and having a way to measure your campaign is so very important, and sadly often over looked. Think strategically and decide what you’re going to do before you launch, and start small, you can always expand once you have results. #3: SOCIAL MEDIA ACTUALLY WORKS! Natascha shared a great statistic from Forrester Research within her SlideShare deck, “85% of business decision-­‐makers said at least one social media channel is important when making technology purchase decisions.” Social Media has the power to influence the decision makers. When leveraged properly social media channels are a great place to share content to help influence and drive decision making at the very early stages. Make sure you have solid content which targets and engages with your audience. Social Media is a platform to drive conversation and any post should always focus around engagement. It doesn’t matter if you have 20,000 or 200 followers, what matters is that you have a captive and engaged audience. I find visual content works well for my account to drive the RTs, Likes, and Shares. Why should your audience follow you, and what’s in it for them? You need to answer this question, and them means the people within your social media community. It’s crucial to wear their hats and build content which excites, engages, and motivates your audience. Know your audience’s needs, and be the source they go to get information and content. This takes me back to the top rule, always have fun and mix it up!